Pharmacy racks need to be designed to strike a balance between available floor space and an effective storage system while ensuring that it stays in line with the workflow. On that note, Adequate Steel offers the best options for pharmacy racks that will ensure that all the boxes are ticked and it offers the best racking and storing solution for its pharmaceutical clientele. More often than not, pharmacies prefer to have a mix of both open and closed storage systems. This is because an open storage system facilitates easy handling during operational hours for the pharmacies. Not all products can be kept in the open and hence there is the need to have a mix of both open as well as closed systems. It is all the more advantageous if the racking system offers both and that is why there are more combination racking solutions available to tackle both. Adequate Steel just the right blend of both open and closed storage systems for pharmacies. The right choice that blends in with the floor plan can be chosen as all the four standard choices available can be handy in any pharmacy. 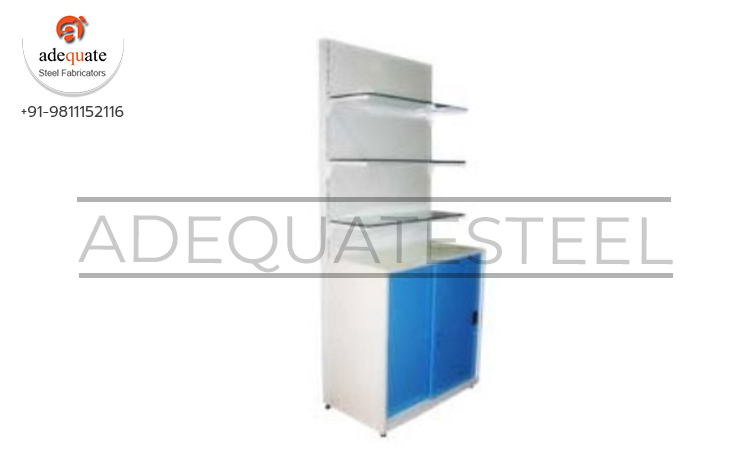 Adequate Steel offers slat wall racks for prominent displays, pharmacy racks with top storage facilities, pharmacy racks with bottom storage facilities and metal showcases..